Tara Prakash is a postdoctoral fellow in the Near Eastern Studies department at Johns Hopkins University. She received her PhD in ancient Egyptian art and archaeology from the Institute of Fine Arts, New York University. Her research interests include issues of ethnicity and identity, foreign interactions, artistic agency, and the uses of statuary in ancient Egypt. She is currently writing a book on a unique series of Egyptian statues that depict kneeling bound foreigners and are known as the prisoner statues. Statues in ancient Egypt were extremely powerful images. Following the appropriate rituals, a statue could eat, breath, smell, and see. Today, the ancient Egyptians are most famous for their large-scale stone statuary, but over the course of their history, the Egyptians also carved many other types of smaller statues and statuettes from an array of different materials. These were equally powerful objects, and they played important roles in ancient Egyptian society and culture. During the fall semester of 2017, undergraduate students had the unique opportunity to work directly with statuettes in the Hopkins Archaeological Museum as part of our class “It’s Alive! Statues in Ancient Egypt.” This course explored a variety of statue types from throughout Egyptian history in order to better understand how and why the Egyptians used statuary. As part of the final project, each student studied a different object. Because all of these objects are unpublished and unprovenanced, they presented significant challenges. Using direct observations and research, our students developed interpretations and arguments for the original purpose, context, and date of their statuettes. The findings of the class are shared here. 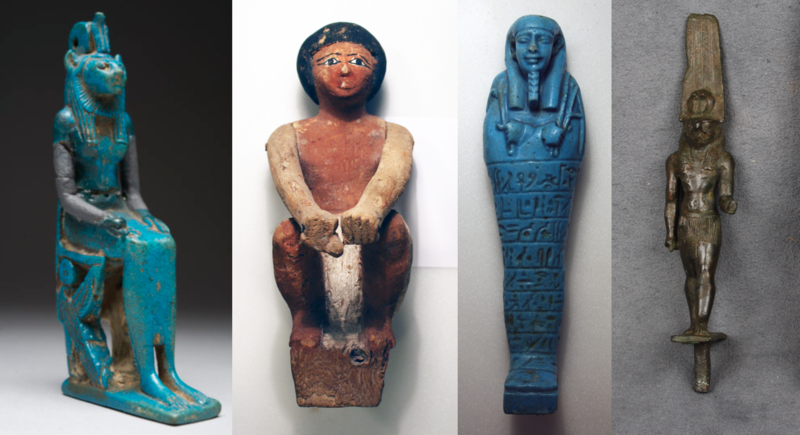 Together, this group of objects helps demonstrate the breadth and diversity of Egyptian statuary. We would like to sincerely thank Sanchita Balachandran for her help throughout the semester and with this project. Is it too Late (Period) now to say Shabti?